Recently I was having a quiet morning with God. It'd been a busy week, and I'll be honest, I was beyond spiritually dry. I'd sat my devotional and my Bible on the counter, grabbed a cup of coffee, and perched on my stool. Then I invited God to just talk to me right there at my counter. And you know what, he did:) Isn't that just like our Father? He longs for time with us. The conversation flowed as I flipped through the passages he directed me to and pondered the insight he delivered. It soothed my soul. Then right in the middle of our talk, my phone dinged. I'd had it near me because one of the devotionals I do is on it. I couldn't help my eyes, they cut to the side to see who'd texted or emailed. Turns out it was an important text that I believed I needed to answer. So I grabbed my phone and did just that, then sat it down and picked up with where God and I were at. Another minute and another ding from my phone. Another item I felt I needed to answer, so I did. As I returned once again to my Bible, another beep erupted from my phone and as I reached for it, God delivered a picture straight to my heart. It was of myself at a dinner table in deep, intimate conversation with a friend. I never saw their face, but I know our conversation was important. Right in the middle of their speaking, another person approached and interrupted...and I gave them my full attention leaving my friend open-mouthed and mid-sentence. Then after I finished my new conversation, I turned and expected for my friend to continue as if nothing strange had occurred. And I thought, Lord, I'd never do that to someone. To which he replied, "You just did. To me." Friends, how easy it is to let distractions around us interrupt God's voice. Oh, may we not do that! If we wouldn't let someone break into our conversation with a friend, let us definitely not do it with our God. Protect your time. God may not be physically present in it, but his presence is still there. He is still there. Wanting to talk if we'll only stay engaged and focused with him. So put aside the distractions. Sit with him. Listen to him. 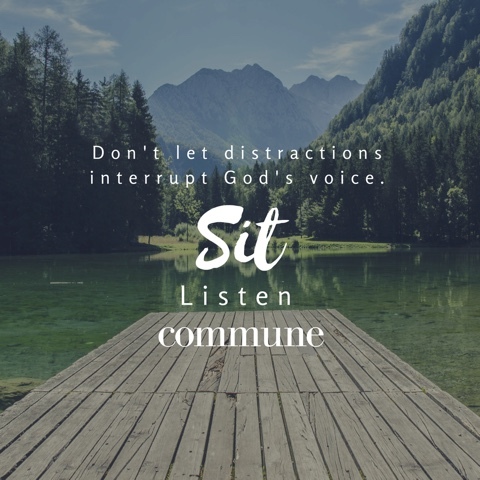 Commune with him. You'll be amazed at all he has to say if you'll only listen.